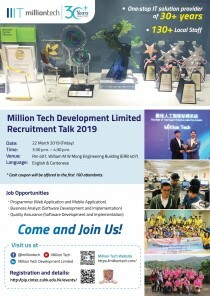 Recruitment Talk by Million Tech Development Ltd. Registration will be closed at 11:00, 22 Mar 2019. Those who are not registered may try to walk in on a first-come, first-served basis. Million Tech is specialized in providing effective and innovative IT solutions and services. We have been serving a wide spectrum of customers in Hong Kong for 30 years and have more than 130 staff. People are important stakeholders in our business. We are keen on developing the individual strength and potential of each teammate. We are dedicated to maintain a positive and cooperative workspace to create values and make a difference together. If you are passionate for technology and desire for achievements in your career, join us now.